The Russian company Lukoil and the Oil Exploration Company of Iraq have signed a memorandum on gas exploration in the Western Euphrates block in Iraq. Until now, the Russian company has participated only in oil extraction projects in Iraq. The decision on signing a final contract will be made ​​after a thorough evaluation of the block, said Lukoil. The company hopes to find major reserves there. By comparison, on the neighboring Akas plot, being the developed by the Kogas Company from Korea, the gas reserves are estimated at 160 billion cubic meters. This is not the first gas project for Lukoil outside of Russia. Lukoil Overseas, a subsidiary of Lukoil that manages the overseas projects of the parent company, is already extracting gas in Uzbekistan and Azerbaijan, and also owns a gas project in Saudi Arabia. In 2013, Lukoil Overseas produced 6 billion cubic meters of gas – which is one third of the total gas production of Lukoil. Previously, Lukoil was engaged only in oil production in Iraq. 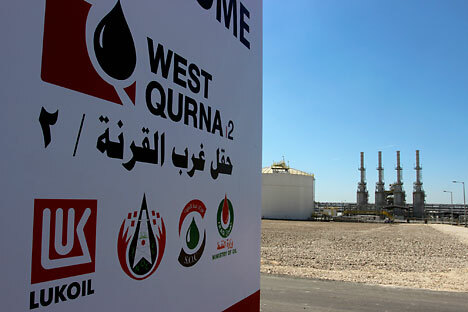 In March, the company began to develop the Iraqi field West Qurna-2, with oil reserves of 1.8 billion tons. By 2017, they plan to produce 60 million tons of oil annually. Fields with recoverable oil reserves of about 14 billion barrels are located in southern Iraq, 65 kilometers north-west of the city of Basra. The contract to develop this field was concluded by Lukoil back in 1997. Then, in 2002, the Iraqi government took away the right of the Russian oil company to develop the field, but in January 2010, Lukoil won a contract for a period of 20 years. Now the company plans to participate in the tender for the Nassiriya project in Iraq. Oil reserves of this field are estimated at 535 million tons.